Although this is a relatively new building, the site has boasted a pub since the 16th century. 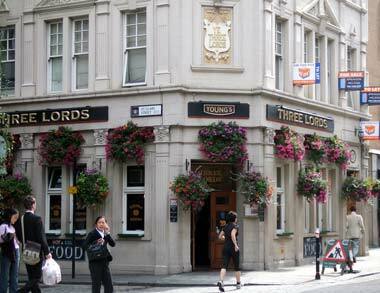 The name 'The Three Lords' comes from three Scottish noblemen (Lord Lovat, The Earl of Kilmarnock and Lord Balmerino) who all had their last nights rest, their last meal and their last drink at the original inn. The three lords had been involved in the 1745 Rebellion when Prince Charles tried to overthrow George II. For there involvement they were beheaded as traitors. In the sixties the bar staff would dress in tartan, but not today. The street level bar is a comfortable size, making for a friendly atmosphere, there are a few seats dotted around, but this bar is intended for standing and drinking, service is always fast and pleasant especially so, when serviced by Gayle. For those who prefer to lounge, there is the downstairs bar, offering an excellent venue for a lunchtime meal. My preferred solution to lunch, is a couple of pints of cask ale accompanied by fresh handmade sandwich. The Three Lords offers the most delightful sandwiches and although the beer is not accredited with the cask-marque it is of sufficient quality to have you coming back for more. I'm pleased to say, that an old East End pub tradition of serving snacks to their customers on a Friday night is being kept alive by Mickey Quinn, and his staff at The Three Lords. Even though Debbie has to stay late to prepare, it's never a problem and the team effort pays dividends with loyal regulars.